In 2012 I got together with Alexander Osterwalder, Henry Chesbrough and Andre Marquis to think about the Lean and the future of corporate innovation. We had some radical thoughts how companies were going to have change to remain competitive in the 21st century in a blog post. What we didn’t envision was that one creative corporate VP would take that post and build a world-class corporate innovation program around it. 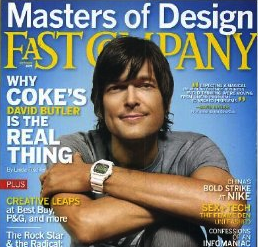 David Butler is the VP of Innovation and Entrepreneurship of at The Coca-Cola Company – responsible for finding breakthrough innovation and building an entrepreneurial culture. Here’s how he’s shaping the future of corporate innovation. Innovation isn’t the destination it’s the Journey. What CEOs, management teams and shareholders care about is growth—revenue growth, greater user adoption, increased market share, bigger margins, etc. So the first step for any corporate “innovation” organization is to tie the word, “innovation,” to the more tangible concept of “growth.” That single step can create a lot of clarity and direction for the organization. “Breakthrough Innovation.” Innovation can create 2 kinds of growth: sustaining innovation (small and incremental growth yet predictable) and disruptive innovation (explosive exponential growth yet highly uncertain). Like most big companies, we’re pretty good at the kind of innovation that creates incremental growth. We know how to fund it, how to staff it, how to measure it, etc. For the past year or so, we’ve been focused on disruptive “breakthrough” innovation (game-changing, etc.) to create exponential growth. Innovation sounds easy. It never is. In our case, we’re local in over 200 countries with operations in basically every city on the planet. We have a portfolio of more than 500 brands and 4000 products and people invite us into their lives more 1.8 billion times a day. Our market cap is around $170B. For most big, established companies like us, our business models were developed years—even decades ago. We’ve built up strength in executing our business model, not creating new ones. So, if you’re Coca-Cola, where do you begin? There are co-working spaces in basically every city in the world—from Nepal to New York. Almost every large organization has some kind of incubator or accelerator program. And this has created a global entrepreneurial ecosystem. But most big companies are still in the shallow-end of the entrepreneurial ecosystem pool. And this is ironic because big companies have so much to add. Big companies know how to scale—most have a lot to learn about starting (as in Lean Startup) but they know how to leverage assets, use network effects, plan and execute. Big companies with big brands have a lot to learn from startups but together, they can do things neither one of them could do alone. And that has become our vision—to make it easier for starters to be scalers and scalers to be starters. 21st century corporate survival requires companies to continually create a new set of businesses by inventing new business models. What is sometimes missed is the opportunity for big companies to leverage their enormous assets (brands, relationships, routes-to-market, etc.) in developing these new models. Most startups can only dream of the kinds of assets most big companies have. We believe that using the customer development process to monetize these assets through new business models can create huge competitive advantageand more speed to market for us and other big companies. Most of these new businesses need to be created outside of the existing business units. We’ve found that this can only happen if it’s just on the edge of a business unit. Startups need to be close enough to the BU to validate assumptions and leverage BU resources (people, funding, relationships, etc.) but just far enough out to be able to use different processes and systems to move fast, pivot, etc. But there’s no one-size fits all approach to this—every company will have to figure out what works for them. The exact form of the new business models is not known at the beginning. It only emerges after an intense business model design and search activity based on the customer development process. This is so true but so foreign for most big companies. And why wouldn’t it be? All of their internal systems are designed to keep doing what they’ve always done best. They are also under huge pressure to deliver quarterly earnings for shareholders and meet analysts expectations. Using an alternative process including different systems and metrics is key. Companies will have to maintain a portfolio of new business model initiatives, not unlike a venture capital firm, and they will have to accept that maybe only 1 out 10 initiatives might succeed. We’re hoping for 1 out of 10 but hedging our bets by launching and networking “Accelerators” around the world in both developing and developed economies—from Bangalore to Buenos Aires. We call this our Accelerator Program but our goal is to create new startups, not really invest in existing startups like most traditional accelerator programs. When we need to mash-up with a startup to do something neither of us could do alone, we’re doing that but or goal is to really build new companies. To develop this new portfolio, companies need to provide a stable innovation funding mechanism for new business creation, one that is simply thought of as a cost of doing business. Absolutely, but it’s not just about a new “innovation” fund—that’s almost the easy part. The hard part is designing all of the systems to enable the success of the startups. From Tax to Legal to Finance to HR, designing the new systems requires enormous amount of collaboration, transparency and trust. Many of the operating divisions can and should provide resources to the new businesses inside the company. That’s the only way this works. Everybody has to have “skin-in-the-game.” But again, when you get this right, it can create enormous engagement and excitement inside the Business Unit and across the company. We need a new organizational structure to manage the creation of new businesses and to coordinate the sharing of business model resources.Again, absolutely true. But in our case, creating the new structure and systems has been almost like starting a startup. Pitching to senior management, using minimum viable products (MVPs), validating assumptions through lots and lots of testing, pivoting hard when you need to—all of this is required in setting up the structure and systems to do this inside of a big company. Some of these new businesses might become new resources to the existing operating units in the company or they could grow into becoming the new profit generating business units of the company’s future. We’re betting on the latter. Our goal is to create new, high-growth companies outsideof the NARTD industry (non-alcoholic ready-to-drink) through this program. We have literally hundreds of thousands of people focused on our core business. We’re hoping to use this opportunity to leverage our assets in new, fast-growing industries. Finding the balance between transparency and opacity is critical. Inside the company, the person or team or group that’s been asked to lead this effort must be completely transparent—function agnostic, open, inclusive, freely sharing everything. This is so new for everyone involved, that there can’t be any kind of “black box” or “cool club” perception around this or it won’t work. On the flip side, just like it is for every startup, there is so much iteration, learning, testing, etc. going on that even if you wanted to talk about what you’re doing in detail, it would sort of depend on the day as things change so frequently. We’ve found it best to take a “more is more” approach internally and a “less is more” approach externally. Nobody, no matter how smart they are, can do this alone. Forming informal networks, both internally and externally, is key. It’s really important for the co-founders of the internal startups to build relationships across the company. And in the same way it’s equally important for the company to authentically connect with the startup community. Being very open and honest with what they’re trying to do is key. And we’ve found that once we built this bridge, we’ve been able to count on a lot of help from the startup community (and visa versa). And as the relationship grows, so does the trust. These are still early days for us at Coke and we have a lot to learn. But we feel that if we and other big companies can get this right, it could be really big. I will agree with you that innovation isn’t easy. In fact, we can’t even define it and now, we want to disrupt it. Then, we read about people who want to disrupt. disruptive innovation. You can’t help but wonder what’s up with this catchphrase.